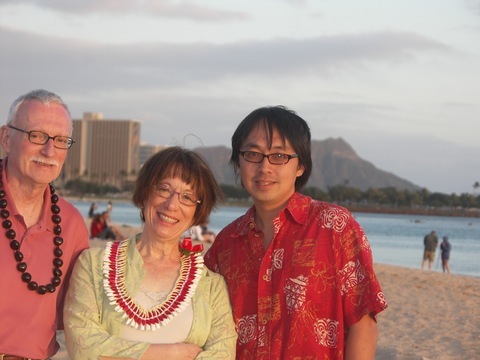 Marie and Jim Wolf arrived in Hawaii along with the threat of a major wave--talk about making waves! Their first mini blogger convention was hosted by our very own dear Hector Wong. Lucky Wolfs! How perfect that "Bake Along" meets "Hector's Take." The leis the Wolfs are sporting are a gift from Hector who writes: It is tradition you get one, specially from a local or if this is your FIRST visit. Jim has a lei strung with kukui nuts. They can keep this and many people frame it. Marie has a lei made from white ginger blossoms before they open, and overlay of red petals from eryhrina crista galli (I think). I love the ginger lei, but is only lasts 24 hours. Someone should make lasting necklaces of these exquisite accessories!